Wherever we live and work, no matter what our age. NOTES: I think this is what is called ‘free verse’ – I just can’t get it to parse – it rhymes, but still reads more like free verse. Maybe time will help me put it into shape. Last night, however, I wrote hurriedly, so enraged by what I saw as Morrison’s ultimate abuse of the aged care and disability sector, using us all as ammunition, a last attempt to buy votes. I trust my ‘fellow’ Australians, young and old, needing or giving care, will show how wise they can be when when we finally get that much needed election! Why? ‘Cos it’s St Valentine’s Day? Question Time – so many speeches! Now that’s pommie speak for trousers! Think of that you right wing wowsers! Labor left wing rabble rousers? They’re pleased to see him hale and hearty! Rosy-red faced! Feisty! Just the man to lead his party! NOTES – For once I’m on Barnaby’s side! Beetroot-red faced as he’s so often described, I thought of him as rosy-red and with a lover, passionate, today of all days, February 14th, he deserves a kinder soubriquet. And that rage of his in Question Time today was a delight to behold with Members on the Opposition benches all smiling. I can imagine one of them sending him a bunch of wilting red roses they might find left over on the supermarket shelves if a late night sitting sends them out looking for a takeaway snack. Two days on and I think the ALP are still delighted that Barnaby is hanging in there as leader of the Nationals, despite their harassing the PM yesterday for not seeking his resignation. Malcolm Turnbull’s address and ‘not commenting’ on this ‘personal tragedy’ but nonetheless from now on proscribing any sexual relations at all between Ministers and their staff has caused an unexpected tightening of the National Party ranks behind their ‘unwise’ leader. Barnaby now has an opportunity to be on the front foot again instead of displaying that very shamefaced expression of his when apologizing to all the women in his life and to all of us Australians who put their trust in him when they elected him to high office! What next for our Coalition Government with its majority of one in the House of Reps????? I wonder how FPM Julia Gillard would have handled this sort of crisis? I watched the ABC program this evening on Aussie masculinity. I was interested to see how boys and men in Oz experience life and growing up today compared with three quarters of a century ago in working class wartime England. Back then it seemed to me my own four brothers were somehow privileged and that as a girl I was disadvantaged, and always struggling to hold my own against them and other boys. I don’t think I gave much thought to their National Service for two years which could involve them in military training for war on battlefields in Korea once the Germans and the Japanese were beaten in 1945. Even so I certainly didn’t imagine that boys and men born no matter where in the western world were many times more likely to kill themselves even in peacetime than were women. I go to bed with these verses in my head written many years ago. My Neighbour Died The Other Day. My neighbor died the other day, by his own hand. What it was he had in mind, what it was he planned? And said, “You’ll be sorry. Just wait, you’ll see! With hindsight that’s as clear as any threat could be. That’s what I feel, my unspoken point of view. That this was something he planned to do. Assuaging guilt and what will be unending grief. NOTES: Suicide has rarely impinged on my own life or the family circumstances of those around me though issues of gender equity often have in a very real way. Social scientists have researched and written much about the gender disparity in suicide rates no matter where in the world. Tonight’s program had me re-thinking my experience of what seemed to me a very un-fair go in my working life here in a Land Down Under. How ironic is that? That hit was sung by Men at Work in the birthplace of Germaine Greer, near contemporary of mine, world-wide champion of Women’s Lib! But why is what comes to mind no militant chant for women’s rights to equality, but rather this long ago regret for the sadness of that neighbor who seemed so rough and tough when he told me how one day I’d be sorry! I should have been more kind to him! Adam Delivers the Goodes For Sophie And Many Other Fans! What a great picture and story behind it to come out of the Adam Goodes controversy! 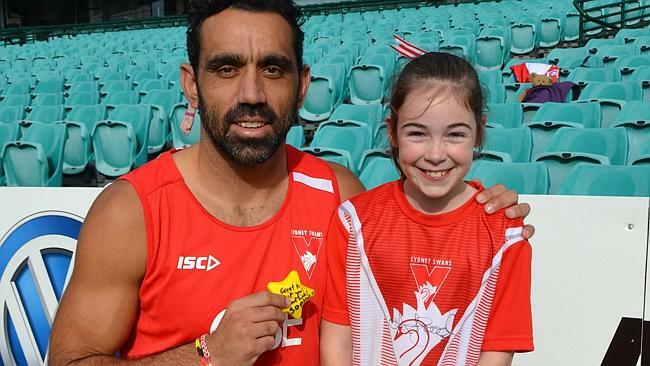 Reading about Adam Goodes and his dance demonstration against the booing of some footie fans, I was very touched by the story of his meeting with Sophie Wrigley. I look forward to reading more about her and her courage. I’m not just talking about her standing up for her hero by being a Sydney Swans supporter while living in Geelong! I am so impressed by the way she has dealt with her lifelong disability caused by pre-natal cerebral palsy. I see too that she is also the only girl in the Grovedale under-12s footy team. Now that shows real nerve! So here for Sophie are the lines which kept running through my head as I read about Adam Goodes and all the fine work he has done for Australia and for Aboriginal people as well as being a great footie player. I’m sure Sophie knows about Robin Hood who was my own hero at the Saturday morning pictures way back in the the last century. Adam Goodes! Adam Goodes, on the field again! Adam Goodes, Adam Goodes, out there with the men! Booed by the bad, cheered by the good! Adam Goodes! Adam Goodes! Adam Goodes! Adam Goodes! Adam Goodes, rose above the muck! Adam Goodes, Adam Goodes, playing in the ruck! Adam Goodes! Adam Goodes, not beating his chest! Adam Goodes, Adam Goodes, fairest and the best! Adam Goodes! Adam Goodes, Australian Of The Year! Adam Goodes, Adam Goodes, see him throw that spear! POST SCRIPT 20/09/15 Adam Goodes at age 35 officially retired yesterday with much praise from commentators, accolades from fellow players and regrets expressed by many about the remaining culture of racism in the sport he so excelled in. 04/09/16 Still too soon to write of ‘closure’ on this issue.